AppAuth strives to directly map the requests and responses of those specifications, while following the idiomatic style of the implementation language. In addition to mapping the raw protocol flows, convenience methods are available to assist with common tasks like performing an action with fresh tokens. The library follows the best practices set out in OAuth 2.0 for Native Apps including using Custom Tabs for the auth request. For this reason, WebView is explicitly not supported due to usability and security reasons. The library also supports the PKCE extension to OAuth which was created to secure authorization codes in public clients when custom URI scheme redirects are used. The library is friendly to other extensions (standard or otherwise) with the ability to handle additional parameters in all protocol requests and responses. 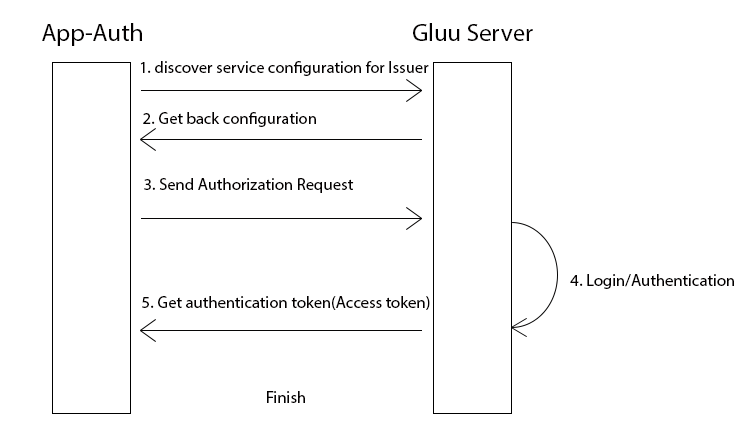 Gluu server is certified OpenId Provider and supports Native Apps either through custom URI scheme redirects, or App Links. AppAuth supports both manual interaction with the Authorization Server where you need to perform your own token exchanges, as well as convenience methods that perform some of this logic for you. This example uses the convenience method which returns either an XXXAuthState object, or an error. XXXAuthState is a class that keeps track of the authorization and token requests and responses, and provides a convenience method to call an API with fresh tokens. This is the only object that you need to serialize to retain the authorization state of the session.